There is something magical about a made bed. It creates a sense of accomplishment, tidiness, and organization. It means that you are a doer, an achiever, someone who knows how to tuck in the sheets and fluff the pillows. Then, there are those who argue that it’s a waste of time. This is because (unless something goes terribly wrong … or maybe right), you will just unmake it again at night when you go to bed. So what’s the point? For most my life, I’ve identified with both sides of the debate. I love it when the bed is made. It’s like the whole room sparkles. Imagine fancy sparkles all around the bed. Of course, this requires effort and motivation, both things I don’t always have a lot of. Sometimes, I rationalize that I shouldn’t waste precious hours (okay, minutes) on something so fleeting and meaningless (in the overall scheme of things). I could spend those minutes editing my book, or posting comments on Art’s epic comment thread. (As an aside, Art from Pouring My Art Out has been working tirelessly to break the record of number of comments on a blog post. I’ve spent a fair amount of time over there in my kitty cat pajamas and zebra slippers. As of now, his post has over 15,000 comments. You should check it out). So, on these days, I leave the bed as is: no tucking, no straightening, and no folding. 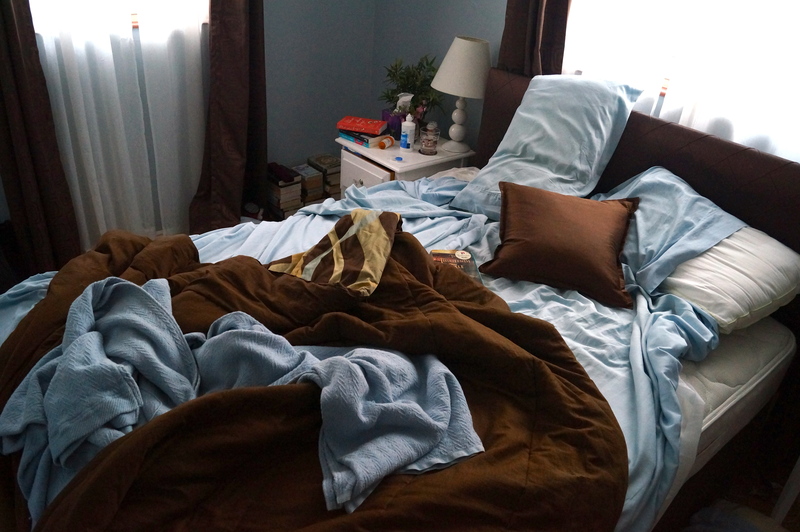 Sometimes the bed goes unmade for days and it begins to look like we sleep in a vortex of sorts. 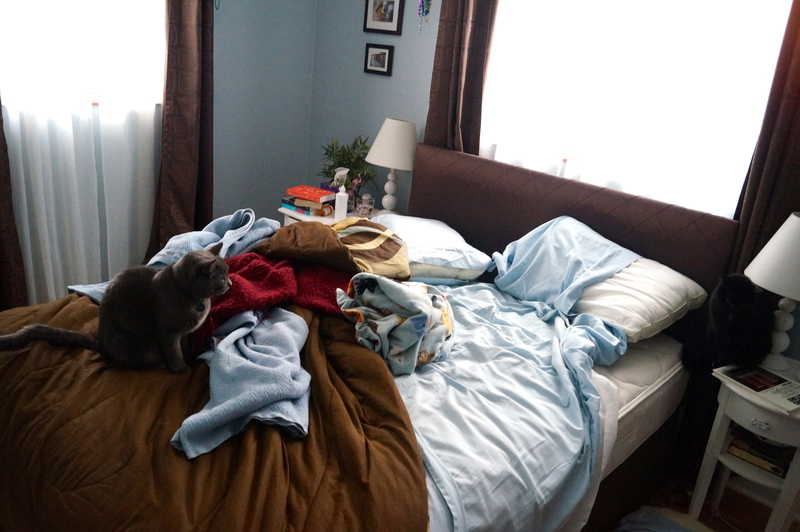 You can see the mattress pad has slipped off the corner – this always happens on my husband’s side. I think it’s because he spins like a hotdog on one of those roller things. I, on the other hand, am the blanket stealer. Now, this is after about a week of no bed making. The mattress pad is off both corners, the comforter is completely sideways, and after a little digging I found the book I lost two days ago. 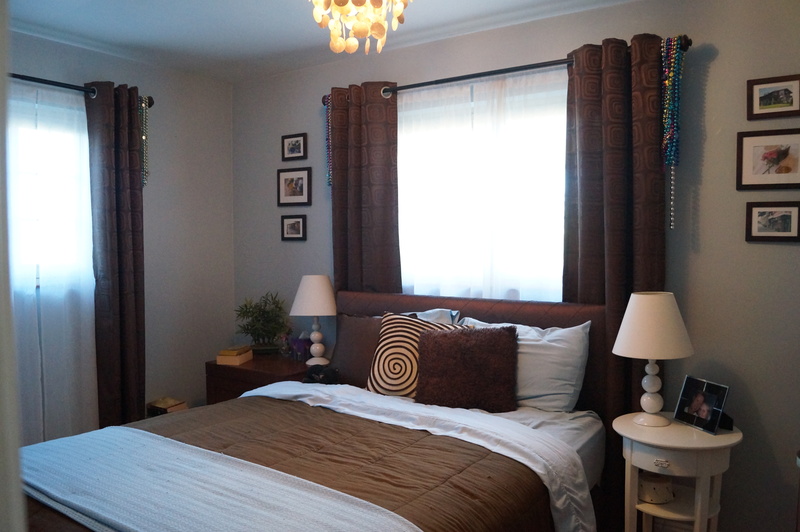 So, you might start to think that I just randomly decide whether or not to make the bed, depending on my mood, or very busy blogging schedule. Well, it’s not really true. I’m about to confess to something big here: I use bed making to keep my husband’s expectations low. And it’s a very calculated process. You see, I work from home on a very part time basis and my husband works full time at an office job. We haven’t set any expectations about who is responsible for what around the house, but I like to do a little cleaning here and there, so the house isn’t a disaster when he comes home. Now, the one caveat with this is you can’t go and make the bed every day. More bed making does not equal more awe and praise. It is the law of diminishing returns. More bed making will eventually result in diminished wonder and awe. Worse, bed making will no longer be seen as an amazing accomplishment. It will no longer be seen as special. It will become the expectation. 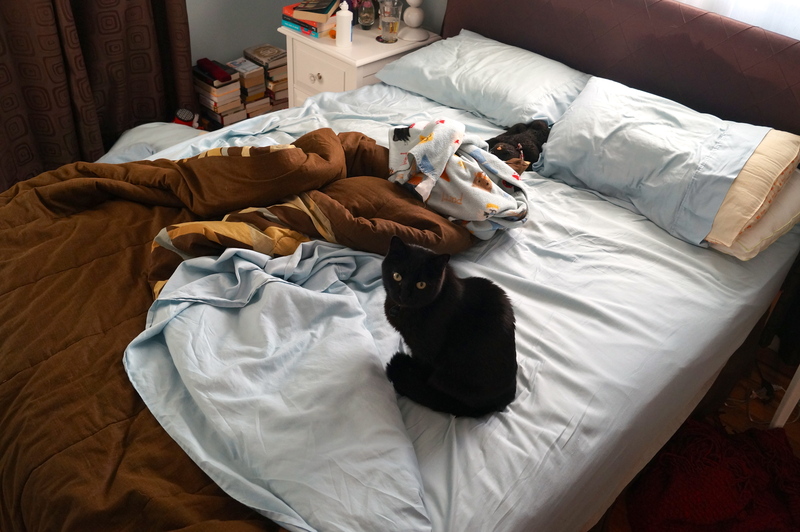 So, if you ever come to my house and see the bed is unmade, you now know why. And if you come by tomorrow, the bed will be made. Because, based on my calculations, tomorrow might be bed making day.